From the weird and creepy stories of Stephen King, we get the reincarnate story of Pennywise the clown who terrorizes the children of a cursed little town in this remake. 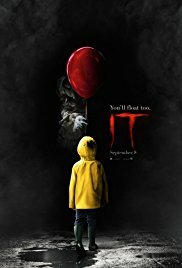 It's certainly not held in this era but the special effects and cameras used, shows a sharper image and overall a better quality than the original "It". Cast: Jaeden Lieberher, Jeremy Ray Taylor, Sophia Lillis, Finn Wolfhard, Chosen Jacobs, Jack Dylan Grazer, Wyatt Oleff, Jackson Robert Scott, and Bill Skarsgård. Pros: With better quality in shooting the different scenes you get more scared and creeped out by Pennywise and the images he shows the kids to fear him. I liked the overall comedy that was introduced and although this was a thriller/horror flick the comedy made all that scary stuff pass by a little easier with some laughs. The chemistry between the characters was incredible, it reminded me of how great the Netflix series "Stranger Things" was: so smooth with each cast member. Not only did the story progress with each scene the actors made it so much enjoyable as well. Cons: I don't have very many cons that I can think of that made me not like it but other than this being a Drama/Horror film I didn't expect it to have so many comical moments. Which I personally didn't mind but from other critics that was one issue. 'It' was definitely a movie worth the hype. Not only did I get scared and jumped up in a few scenes I enjoyed watching the adventure of these kids struggling in fighting this demonic clown. There will be a sequel so let's see how that turns out but for now, go with friends or whomever and go laugh and get scared in this fun ride of a classic remake and you'll float too.